Web Connection v4 and v7 on same site? Is it possible to have both v4.68 and v7.02 of Web Connection running on the same web site? I have a web site that works well with v4.68. What I want to do is add API functionality to the site but that wasn't added to Web Connection until later versions. Ideally, there would be another virtual directory called "api" within the default web site. I downloaded WC v7.02 and installed it. There didn't seem to be any trouble with the installation but when I tested the old site, it was broken. It seems that the application pools and other things get overwritten. I wasn't able to fix this. Fortunately, I'm testing this in a virtual machine and restoring it was easy. So, before I spend a lot of time trying to make this work, I would like to know if there's even a chance that it will work. If I can't do what I want, what are my options? I have no problem registering another domain and setting up a new site specifically for the API if necessary. I suppose that I could switch the old site to v7.02 but my concern would be that something might break and I would be spending time fixing something that wasn't broken. re: Web Connection v4 and v7 on same site? On the same site - yes. 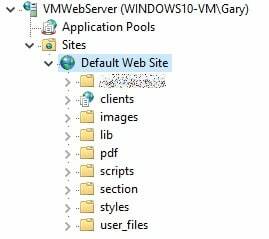 In the same IIS Application/Virtual - no. IOW, you can certainly run multiple virtual directories, or multiple Web sites each with their own version of Web Connection on a single server. But each site/virtual application can only use one version of WWWC. You have to be a little careful with a Root Site and Child Virtual Application because the web.config configuration settings from the root are inherited down into the children, but it's usually not a problem. If it becomes a problem you just have to make sure to unset or override the same settings in the child virtual.